A Fife teenager has been jailed for a violent car-jacking in which he attacked a driver who stopped to help him. ‘Good Samaritan’ Marc Copeland tried to assist Andrew Smith, whose car had become stuck in mud in a Lochgelly public park at around 2 o’clock in the morning. However, when the efforts to free the vehicle proved unsuccessful, Smith attacked his victim, smashing his glasses and taking his car keys. Smith (19) then drove Mr Copeland’s car at speed into his own vehicle in another attempt to free it. Both cars were smashed up as a result then Smith ordered Mr Copeland to get into the passenger seat of his own vehicle, along with his dog. Smith drove off in his victim’s car crashing into a roundabout shortly afterwards. Mr Copeland (21), from Ballingry, then ran from his own car with his dog and hid in a garden to escape from Smith. 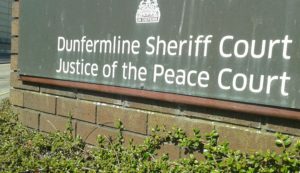 Smith was found guilty of assaulting Mr Copeland on 28th December last year at Melville Street, Lochgelly, after a trial at Dunfermline Sheriff Court. When he returned to court for sentencing, Sheriff Charles MacNair imposed an 18-month period of detention, followed by a nine-month supervised release order. He was also banned from driving for a year. Smith demanded that Mr Copeland got out of his car, he thenpunched him on the head, took the car keys and drove the car, all to his victim’s injury and robbed him of the keys and the car. He had admitted that he was driving as a provisional licence holder without ‘L’ plates and without insurance. Mr Copeland, a painter, told the court that he had been out ‘lamping’ for rabbits with his pet lurcher and a friend. He was driving his car, a 16-plate Ford Fiesta, having just passed his test earlier that month. Between 2 and 3am they came across Smith whose car had become stuck in mud. Smith, a complete stranger to them, asked for help but when the efforts to free his car failed, Mr Copeland drove to another part of the park. However, Smith ran over to the car, pulled open the passenger door and ordered Mr Copeland’s 17-year-old friend to get out. “Then I got out and got hit in the face by Andrew. My glasses were broken,” said Mr Copeland. He said he had fought back but then Smith said he had a knife and grabbed the car keys from him. The incident ended with Smith crashing the Fiesta and Mr Copeland running off and hiding. Asked how he felt during the ordeal, Mr Copeland said, “petrified”.